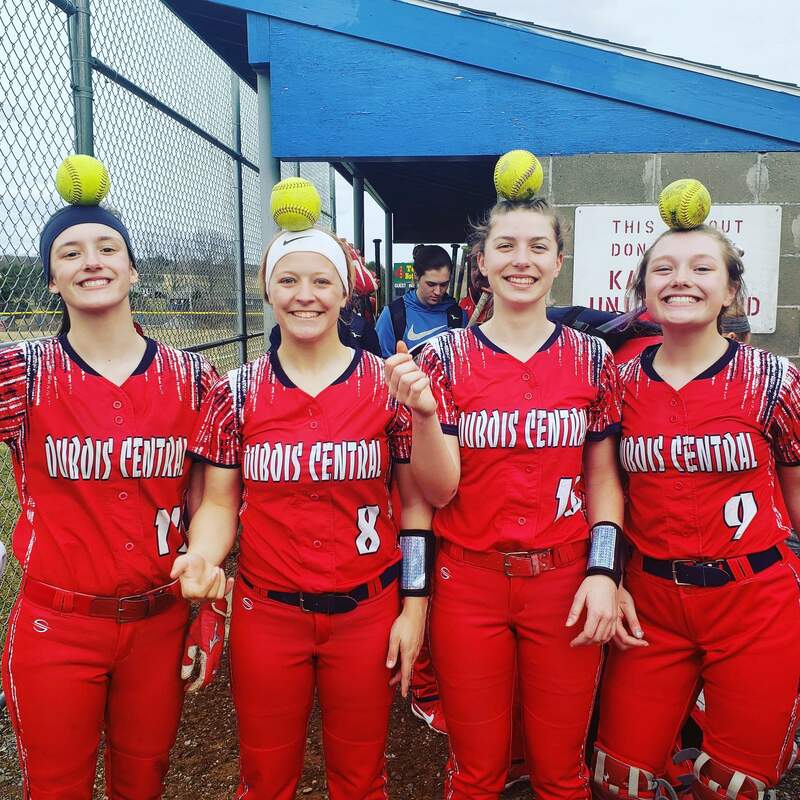 KANE, Pa. – Four different players hit a home run and helped visiting DuBois Central Catholic defeat Kane, 20-0 in four innings. Shayleigh Gulvas, Mia Meholick, Avery Sickeri and Ashley Wruble each hit a home run to lead the Lady Cardinals. Sickeri and Meholick each had a team-high three runs and three RBIs. Mia Cogley went 3-for-3 with a triple and three scores while driving in four runs. Chelsea Bussato doubled on her way to a score and Alyssa Bitter had a pair of hits and three RBIs. Ashley Wruble stuck out four and threw a two-inning shutout in the win for DCC. Rachel Danielson took the loss for Kane allowing eight hits and nine runs in two innings on the mound. BROCKWAY, Pa. – Lindsey Kocjancic and Julie Peterson combine to pitch a 1-hit shutout in visiting Johnsonburg’s 15-0, 5 inning victory over Brockway. Kojancic stared the game striking out two and allowing no hits in three innings. Peters finished the game with two strikeouts and one allowed hit. Jordan Bundy led the Ramettes going 3-for-5 with four RBIs. Skylar Sherry doubled and scored once while Alyssa Kasmierski went 2-for-4 with two runs. Haylee Zimmerman chipped in for three runs. Maggie Schmader had the lone hit for the Lady Rovers. Morgan Lindemuth took the loss for Brockway giving up nine hits and 15 runs while striking out three. 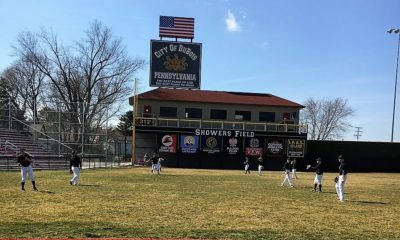 ST. MARYS, Pa. – Curwensville used a five-run second inning to earn a 12-5 victory over Elk County Catholic. Abby Pentz and Joslynne Freyer led the Lady Tide with three hits and two scores apiece. Bailey Bloom doubled and scored twice while driving in a pair of runs while Alexandria Zattoni went 2-for-2 with a double and a score. Tayor Luzier tripled and scored a run. Morgan Wolfe paced the Lady Crusaders with two runs. Sady VanAlstine and Michelle Gerber each doubled and added a score. Ellie Fledderman and Rosina Nero chipped in for a pair of hits apiece. Freyer earned the win for Curwensville with nine strikeouts while allowing seven hits. Gerber took the loss for ECC giving up 15 hits and 12 runs. STRATTANVILLE, Pa. – Rallying with seven runs in the seventh inning for a 9-6 come-from-behind win in the first game, Brookville made it a doubleheader sweep at Clarion-Limestone with a 12-9 victory in the nightcap. In the opener at the C-L Sports Complex, the Lady Raiders trailed 6-2 going into the top of the seventh before scoring seven rusn. Emily Steel and Lauren Hergert both scored on a wild pitch to tie the game, then Megrah Suhan doubled in two runs and scored on an infield error to set the final score. Suhan wound up going 2-for-3 with three RBIs in the first game while Hergert and Leah Kammerdeiner also hit doubles. For C-L, Abby Carl doubled twice and Regan Husted singled twice and scored two runs. Carlie McManigle picked up her first of two complete-game wins, allowing 10 hits while striking out four and walking none. Megan Stahlman was the losing pitcher, throwing 6 ⅔ innings and giving up five hits. Cassidy Makray got the final out of the seventh inning, yielding a hit and an unearned run. Brookville, the home team in the second game that was a makeup of their March 29 scheduled contest, scored in all but one at-bat and jumped out to a 9-3 lead after four innings before C-L cut it to 9-7 with a four-run fifth. But McManigle came up with a big bases-loaded triple in the bottom of the inning. She finished 2-for-3 with five RBIs. Hergert was 3-for-4 with a double and Suhan finished a strong day at the plate with another 2-for-3 game, both hits going for triples and one driving home two runs in the four-run fourth inning. McManigle completed her 14-inning day in the circle, tossing an 11-hitter with a strikeout and two walks with five of C-L’s runs being unearned. Husted had three hits for C-L, one of them a double. Stahlman, Sadie Mahle and Ali Girt each had two hits. Mahle, Karleigh Aaron and Makray also doubled. Makray was the losing pitcher, giving up 10 hits while striking out nine and walking one. Seven runs off Makray were unearned. COUDERSPORT, Pa. – Coudersport used a balanced scoring attack to defeat visiting Bolivar-Richburg, 12-3. Shaelyn Black, Paiton Whipple and Kaylee VanWhy each colled three hits for the Lady Falcons. Tori Miller went 2-for-3 and scored twice while Emma Saulter had a pair of hits and drove in two scores. Chelsey Streich doubled and scored two runs and Claudia Miller doubled on her way to a score. Kelsey Pacer paced the Lady Wolverines going 2-for-4 with a run and an RBI. Courtney Perkins and Sydey Root each had a pair of hits while Maya Graves and Aliyah Cole added a run apiece. Shaelyn Black earned the victory for Coudersport with 13 strikeouts and eight allowed hits. Root took the loss giving up nine runs and 12 hits in two innings for Bolivar-Richburg. Cole pitched the final four innings in relief and had five strikeouts while allowing five hits and three runs. SENECA, Pa. – Alexis Nyquist’s run in the fifth inning broke a 1-1 tie and lifted visiting Warren over Cranberry, 2-1. Kiersten Hoffman led the Lady Dragons going 2-4 including a double and an RBI. Alex Neuriter had a pair of hits and Morga Munksgrad had a hit on her way to a score. Alisha Beggs scored the lone run for the Berries while Andrea Watson and Malliah Shreck added a pair of hits. Maria Anderson and Magan Hadden each singled. Ellie Lobdell stuck out eight and gave up eight hits to earn the victory for Warren. Watson took the loss for Cranberry giving up seven hits and two runs while striking out nine. LIGONIER, Pa. – Ligonier Valley used a balanced scoring attack to defeat visiting Punxsutawney, 3-1. Maddie Griffin led the Lady Rams going 1-for-3 with a run scored. Jane Garver and Nina Christopher each added a run. Kendal Johnston tripled and scored the lone run for the Lady Chucks. Elliott Ferrent had a single and drove in the Johnston run. Garver struck out nine and allowed three hits to earn the victory for Ligonier Valley. Ferrent took the loss for Punxsutawney allowing three hits and three runs while striking out three. CLARION, Pa.- Moniteau used two runs in the seventh to edge out Clarion on the road, 4-3. Megan Wise led the Lady Warriors on offense going 2-for-3 with two RBI’s while Amanda Dailey had two RBI’s of her own. Breanne Noah and Cassidy Claypoole each singled and chipped in for a run. Clarion’s Jordan Best notched two RBI’s to lead the offense while Breanna Campbell picked up one. Carly Best singled on her way to a score and Kaitlyn Constantino added a run. Courtney Stewart was the winning pitcher for Moniteau giving up four hits and one earned run in 4 ⅔ innings. Andrea Eller finished the game on the hill striking out two and no earned runs. Constantino pitched all seven innings for the Lady Cats striking out eleven batters despite the loss. Autumn Smith went 3-for-4 for the Lady Terrors with Kaylee Heller going 2-for-2 with a double. Kaylee Frederick tripled and drove in a run. Alyssa Hardy paced the Lady Owls with a double. Katie Work doubled and drove in a score. Abby Wolfe picked up the win for Otto-Eldred striking out seven while allowing three hits and walking none. Emilie Warner and Adrien Angell combined for four strikeouts and 13 allowed hits in the loss for Bradford. JOHNSONBURG, Pa. – Cameron Marciniak went 3-for-4 and had three runs to lead Johnsonburg to a 6-4 victory over visiting Brockway. Ethan Wells went 3-for-4 including a double and run scored while driving in three runs for the Rams. Wade Steis had a pair of hits and Gavin Elmquist doubled on his way to a score. Benjamin Glasl paced the Rovers with two runs while Tyler Serafini went 2-for-2 with a run and an RBI. Santino Inza drove in two scores and Matthew Clark added a run. Elmquist got the win for Johnsonburg with three strikeouts and three allowed hits in 3 ⅔ innings. Serafini lasted two innings and gave up six hits and five runs for Brockway. Inzana pithed 2 ⅔ innings and struck out one while allowing five hits and a run. COUDERSPORT, Pa. – Garrett Kellert scored on an error at the bottom of the sixth to lift Coudersport over visiting Bolivar-Richburg, 2-1. Blake Burgett led the Falcons going 2-for-3 while Eli Ayers added a hit and drove in a score. Dilan Keglovits chipped in for a run and AJ Redmond had a hit. Riley McDonald tallied the lone run for the Wolverines. Micah Crump, Logan Bess and Alex MacDonnell each singled. Burgett struck out three and gave up four hits in the win for Coudersport. For Bolivar-Richburg, Logan Bess struck out three while allowing four hits and two runs in the loss. 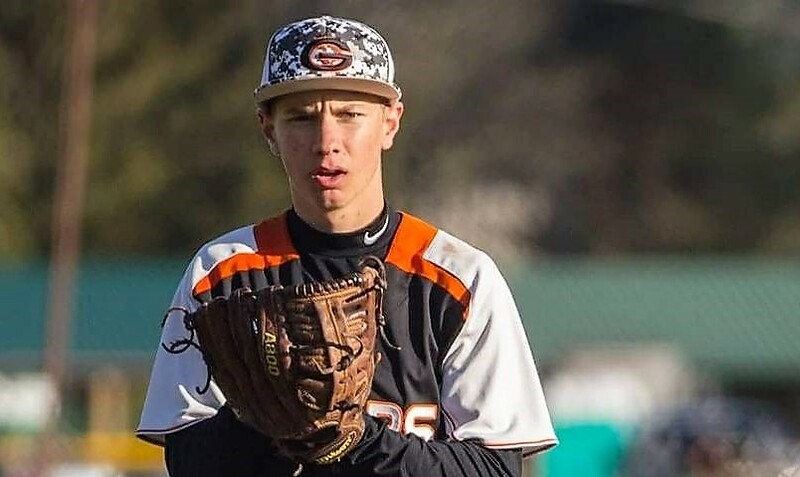 HYDE, Pa. – Eli Glass hit a grand slam in the fourth and helped Clearfield to a 6-2 victory over visiting Penns Valley. Nathan Barr went 2-for-4 and scored a pair of runs for the Bison. Hayden Williams went 2-for-3 and drove in two runs while Karson Rumsky, Kyle Elensky and Caullin Reed each added a score. Cole Breon and Dylan Treaster paced the Rams with a pair of hits apiece. Glass earned the victory with seven strikeouts while allowing seven hits and two runs for Clearfield. Logan Snyder gave up seven hits and six runs while striking out one in the loss for Penns Valley. CURWENSVILLE, Pa. – Elk County Catholic scored five runs in the first inning and held on to defeat Curwensville, 5-4. Hunter Cashmer led the Crusaders with a double on his way to a score and two RBIs. Brennen Klawuhm had a hit and drove in two scores while Will Uberti went 2-for-4 with an RBI. Tommy Slay, Tylor Herzing, Ryan Fritz and Alex Fedus all added a score apiece. Avery Francisco paced the Tide going 2-for-3 with a double and run scored while Jake McCracken added a hit and drove on two scores. Broc Heitsenreather had a pair of hits and Jake Mullins went 1-for-3 with a run scored. Cashmer started the game for ECC striking out five and allowing five hits in three innings. Taylor Boland earned the win with six strikeouts and five allowed hits in the final four innings. McCracken took the loss for Curwensville with five allowed hits and one strikeout in four innings on the mound. DUKES CENTER, Pa. – Cole Sebastian scored four times to lead Otto-Eldred to a 16-1, 4 inning victory over visiting Bradford. Andrew Sheeler went 2-for-3 scoring both times while driving in two runs for the Terrors. Cameron Magee doubled and added two runs while Chase Sebastian chipped in for a run and two RBIs. Tommy Vanscoter and Trent Windsor each chipped in for a pair of runs. Tyler Gigliotti scored the lone run for the Owls. Peyton Manion had a hit and Austin Davis doubled while driving in the lone run. Cole Sebastian got the win with one strikeout and three allowed hits for Otto-Eldred. Manion took the loss for the Owls giving up two hits and six runs while striking out one in two innings on the mound. BELMONT, N.Y., – Cody Schnieder hit a home run and tripled while driving in three runs to lead Genesee Valley to an 8-6 victory over visiting Oswayo Valley. Josh Mcguire went 2-for-4 with two runs for Genesee while Hunter Jones singled on his way to score. Ryler McKnight and John Raub each added a run. Gunner Bean paced the Greenwaves with a triple and four RBIs. Carter Stedman went 2-for-4 with a run and Ian Bilski had a team-high three hits. Ian Coombes pitched one inning and got the win for Genessee with one strikeout and four allowed hits. Evan Windus pitched four innings in relief and struck out two while giving up six hits and a run. PUNXSUTAWNEY, Pa. – Hollidaysburg scored nine runs in the fourth inning and defeated Punxsutawney, 16-0 in four innings. Logan Margroum led the Golden Tigers with four runs while Tristan Chaney went 4-for-4 with a run and four RBIs. Joe Grassi collected three hits and scored each time while driving in two. Daren Byers paced the Chucks with a pair of hits. Adison Neal, Alec Greenblatt and Derek Huey each singled. Helsel earned the win for Hollidaysburg with five strikeouts while giving up five hits. Neal took the loss allowing 10 hits and 10 runs while striking out two for Punxsutawney. FRILLS CORNERS, Pa. – North Clarion led a balanced offensive attack to pick up a 9-3 victory over Redbank Valley. Logan Minich led the Wolves going 1-for-3 with 2 RBI’s while Bryce Byers went 1-for-3 and drove in two scores with a double. Korey Mills went 2-for-2 while Tyler Wolbert and Josh Daum each chipped in an RBI of their own. Ethan Wadding paced the Bulldogs with two runs.Hunter Buzard, Hudson Martz and Jimmy Gundlach all chipped in for an RBI with Martz and Gundlach each going 1-for-3 on the night. Devon Walters picked up the win going five innings giving up two runs on six hits, one walk, and one hit batter. Logan Minich cleaned up in relief going two innings and striking out one batter. Hudson Martz was on the bump for Redbank Valley striking out three batters and giving five hits and three earned runs. Blaney Brooks and Kobe Bonanno came in relief of Martz. 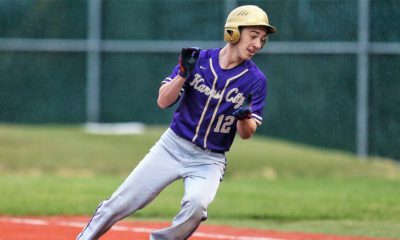 KARNS CITY, Pa.- Karns City’s offense led them to a 9-5 victory over visiting Clarion-Limestone. Conor Schaffer went 1-for-3 with 2 RBI’s for the Gremlins while Cameron Blair went 2-for-3 with an RBI. Cole Sherwin also went 1-for-3 with an RBI with Tyler Yough going 1-for-2 with an RBI. Cole Grenci drove in a score for the Lions with David Wiles going 1-for-3 on the night with a run and two RBIs. Hayden Callen added a pair of runs. Colton Hutchinson pitched strong innings notching seven strikeouts. Hutchinson only gave up two earned runs on the night. Ty Belles and Tyler Yough came in relief to combine to strike out three batters. Callen and Curvin Goheen each pitched over two innings for the Lions. Goheen struck out four despite giving up five hits and six runs. Callen struck out two giving up three walks and two earned runs. RIMERSBURG, Pa. – Strong pitching propelled Union over visiting Forest Area, 15-0 in three innings. Union pitcher, Reice Saylor, saw 10 batters on the day and struck out six while allowing one hit and no walks. Doug Hoffman led the Knights with three runs while Saylor went 2-for-2 with two runs scored and three RBIs. Luke Bowser added a pair of runs with Luke Salvo and Carter Terwint each scoring twice. DUBOIS, Pa.- DCC dominated on offense to coast to a 13-0 home victory over visiting Kane. Domenic Toretti had an excellent night going 2-for-3 and driving in four RBI’s for the Cardinals. Justin Miknis went 1-for-3 with two scores and two RBI’s while Garrett Prosper went 1-for-4 with two RBI’s. Noah Bloom and Brandon Walker each chipped in for a pair of runs. Prosper took the mound for DCC striking out four in 2 ⅓ innings while Walker came in relief striking out three and walking one in two innings on the mound. Austin Jordan gave up five hits and nine runs in the loss for Kane.